*At this price must Finance or Lease thru Volkswagen Credit at Standard Rates. MAY NOT BE COMBINED WITH VOLKSWAGEN SPECIAL APR/LEASE OFFERS OR ANY OTHER SPECIAL BUYING PROGRAMS. All prices plus tax, license, finance charges and a negotiable documentary service fee in an amount of $150 may be added to the sale price or the capitalized cost. Subject to prior sale. Contact dealer for most current information. This offer Expires 4/30/2019. e-Golf Give the city a jolt of energy. Was in a car accident and was told my car was fixed. It was not but I had it towed to Pignataro and they fixed it right away with great customer service. Thanks Nick in service you are the best. 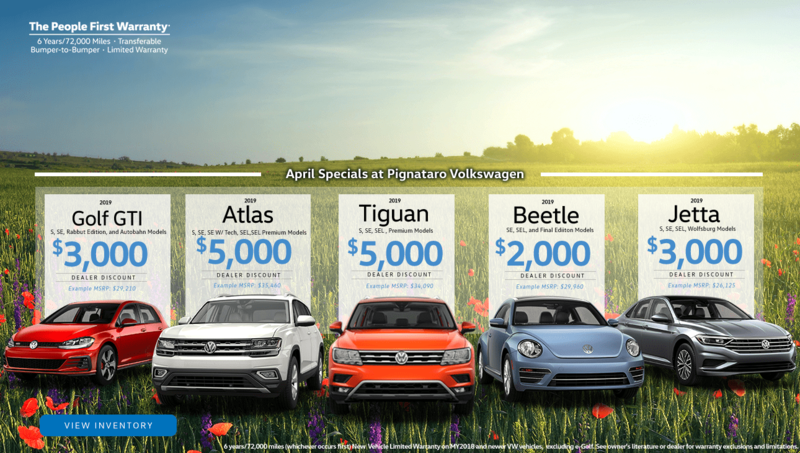 For over 40 years, Pignataro Volkswagen has been providing car shoppers in the Everett area with an impressive selection of vehicles to choose from. Our inventory is well-stocked with all of the best models in the Volkswagen lineup. Pignataro Volkswagen is home to the Jetta, Passat, Tiguan, Golf and Beetle, along with many harder-to-find models like the Golf GTI and Golf R. In addition to our new inventory, Pignataro Volkswagen offers an equally-impressive selection of Certified Pre-Owned Volkswagen models that have all undergone a 112-point inspection before joining our inventory. Pignataro Volkswagen is home to a different car buying experience. Many of our employees have been with us for years, eliminating the frustration that can come from working with someone who is new at their job. If you live near Everett, Seattle, Bellingham, Lynnwood, Edmonds, Mukilteo, Mill Creek, Bothell, Arlington or Kirkland and are looking to take home an excellent new or pre-owned Volkswagen model, Pignataro Volkswagen should be your first stop. Take a look around our site to learn more about everything we have to offer.